footcoords publishes three tf frames usefule for biped robots. * /ground: the middle coordinate of two legs. Two legs are specified by ~lleg_end_coords and ~rleg_end_coords. 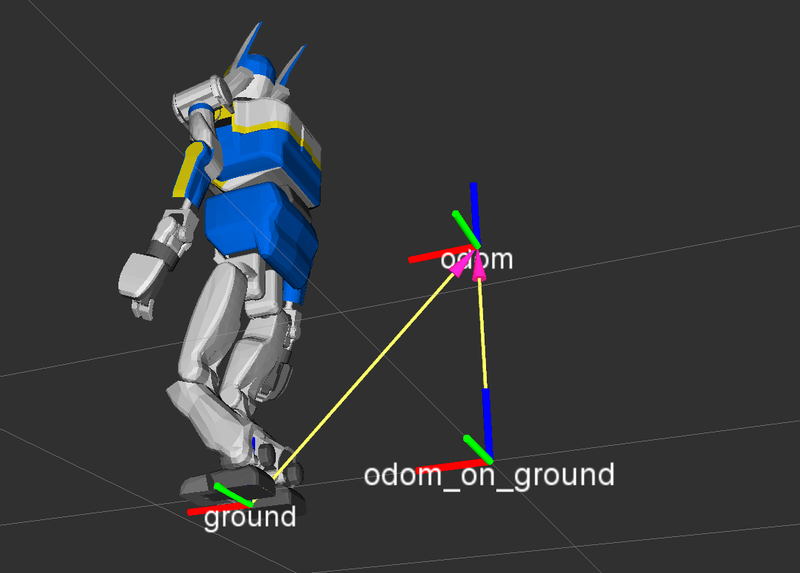 * /odom_on_ground: The coordinate computing by projecting /odom on the plane which is defined by /ground frame. The transformation is updated only if the robot on the floow by checking both of lfsensor and rfsensor provides enough force (the threshold is ~force_threshold). * /odom_init: The coordinate of /odom when the robot lands on the ground most recent. footcoords computes transformation only if these two topic get the same timestamp. State of the robot and it is one of "air", "ground", "lfoot" and "rfoot". Transform force sensor rotation respected to these frame ids when evaluating force value. You need to choose reasonable frame_ids which gives positive z-force value when robot stands. ~invert_odom_init (Bool, default: true) Broadcast tf of odom_init as parent of odom if ~invert_odom_init is true (odom_init -> odom). [jsk_footstep_controller/euslisp/util.l] Set lfoot rfoot offset based on robot model. [jsk_footstep_controller/euslisp/util.l,jsk_footstep_planner/euslisp/footstep-planner-client-sample.l] Move footstep action client utility to util.l and rename functions. [jsk_footstep_controller] Compute root-link height according to torque and manipulability. Original version is implemented by Masaki Murooka and interface of function is modified to use as library. 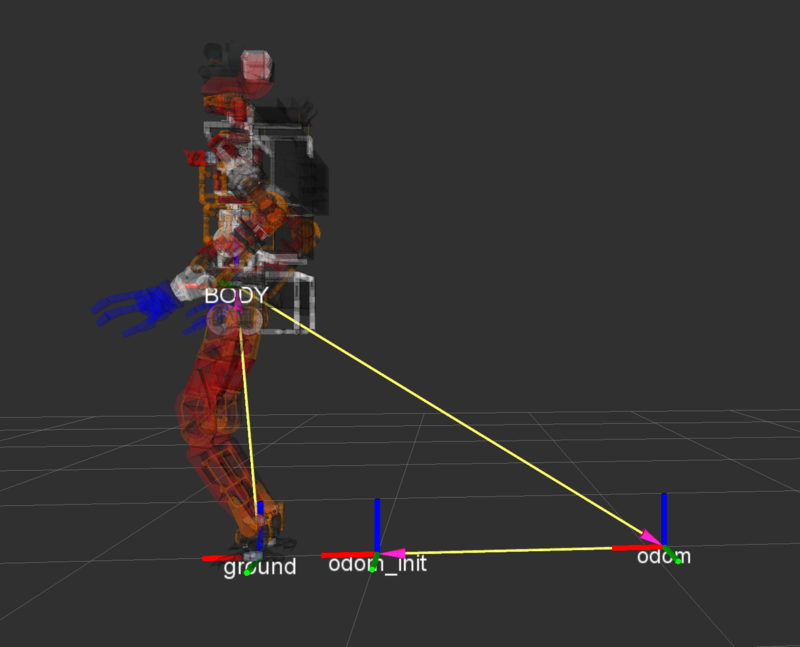 [jsk_footstep_controller/footcoords] Publish body_on_odom frame, which should be useful to represent sensordate in \"Robot-centric-perspective\"
[jsk_footstep_controller] Publish synchronized forces from foot_coords and subscribe it from foot_coords internally. Update alpha (low pass filter parameter) to 0.1 from 0.5. Update queu length not to drop messages. [jsk_footstep_controller] Wait for tf transformation to resolve force sensor transformation. Refine result of footstep planning by filtering goal of actionlib interface of footstep planner.